Take Bus No. 167 from the Port Authority. Ask the driver to let you out after Church Street in Bergenfield. Walk North, and the store will be on your left hand side. Route 4 West to the Teaneck Road exit. Teaneck Road becomes Washington Avenue when you enter Bergenfield. Continue North on Washington Avenue and it will become North Washington Avenue. After the 4th light, which is the intersection of Church Street and North Washington Avenue, the store is located two blocks up, on the left side of the street. At Exit 70A&B, for Leonia/Teaneck, take the 70B exit to Teaneck. You will exit at the Glenpointe Marriott onto DeGraw Avenue. At the next intersection, which is the intersection of DeGraw Avenue and Teaneck Road, make a right turn onto Teaneck Road to head North. Take Exit 161 to Route 4 East. Take the second Teaneck Road exit towards Bergenfield. You will go under Route 4 and head North on Teaneck Road. Tappan Zee Bridge to the New York State Thruway to Palisades Interstate South. Take Exit 2 and make a left. Go to the 2nd traffic light which is Hillside Avenue. Continue on Hillside Avenue as it bends. After the intersection of Hillside Avenue and County Road, Hillside Avenue becomes Union. At the next light which is the intersection of Union and Piermont Road, go straight over the railroad tracks as the road bends to the left and make a right turn onto Madison Avenue. Head West on Madison Avenue continuing up a hill and to a traffic circle. At the traffic circle, go 1/2 around to continue heading West on Madison Avenue. At the 2nd traffic light after the traffic circle make a left onto North Washington Avenue. You will pass a traffic light, then a Staples and Wendy's. After the 2nd traffic light at TD Bank turn right onto W. Johnson Avenue. 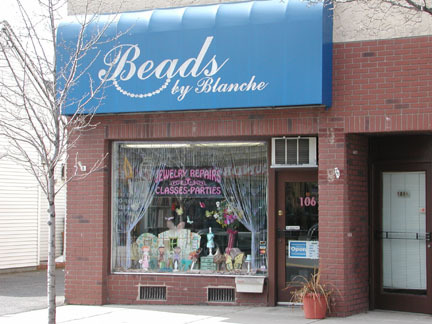 Beads by Blanche is next to Edible Arrangements and we share a parking lot.